After struggling through qualifying yesterday, we were hoping the race itself could deliver some excitement to kick the 2016 season off properly. Boy, did it manage to do that! Changes of race leader, a huge accident, a red flag period, mixed up tyre strategies, inter-team rivalries and swearing over the radio - there really was a little bit of everything. If you missed any of the action, the Factbyte Factbox has you covered. Lap by lap details, graphs and charts help follow the racing action, with the best of the post-race interviews transcribed for your viewing pleasure as well. Hello all! It's race day - hoorah! This is your handy Factbyte Factbox for the Australian Grand Prix, here to guide you through all the madcap mayhem from the first race of the 2016 season. The pit lane has just opened, so cars are heading out of the garage, doing an installation lap or two, and eventually forming up on the grid for last minute checks. All the drivers used up only supersofts during qualifying. Qualifying wasn't a complete success, you might say, and it's anticipated that we'll revert to the 2015 format again from Bahrain onwards. So you can put yesterday out of your mind and we can all pretend it didn't happen. If you did want a refresher of what happened though, check out yesterday's FBFB or the F1Minute roundup. Unfortunately there are a couple of grid penalties already - Rio Haryanto has been given a 3 place drop for causing a collision with Romain Grosjean in the pit lane on Friday, although he qualified last anyway. Also Bottas had a gearbox change so loses five places. Tweet from @ValtteriBottas: Team has found a problem with my gearbox so it will be changed. Unfortunately that is a 5 place grid penalty. Lets do some overtakes then! Brand new rookie drivers setting up for their first race today, and battling the nerves no doubt: Jolyon Palmer in at Renault, starting 13th on the grid. Pascal Wehrlein and Rio Haryanto, both at Manor, and shoring up the last row on the grid. It was slightly disappointing to see that Haas couldn't do a little better in qualifying, they finished just ahead of Manor. But it was their first attempt, so hopefully things can improve for the new outfit. The FIA's radio clampdown is set to be in full effect this year, with drivers able to chatter away as much as they like but the pit wall only able to respond with a certain amount of information. Not a lot of guidance is allowed to be given regarding strategy, competitor information, or all those engine mixes or steering wheel setups. 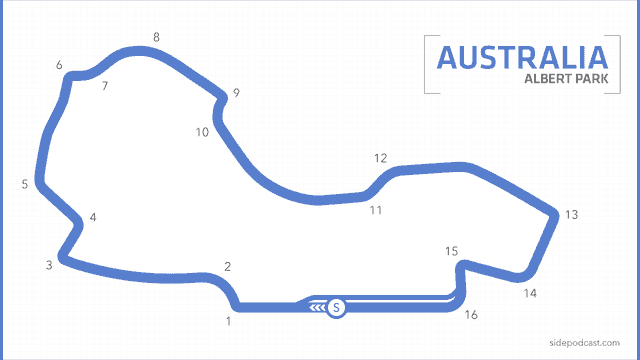 Tweet from @pirellisport: Strategy wise, two stops is theoretically quickest for the 58-lap @ausgrandprix. Start on supersoft, soft on lap 16, soft again on lap 37. Jolyon Palmer, surprisingly calm on the grid: "All pretty good. The sun’s come out, ready to have our first race. It’s a nice feeling, it’s going to be a long race, I don’t really know what to expect. We’re starting plum in the midfield, going to try and move forward. It’s going to be a long slog but hopefully be there at the end and try and get up into the top ten." Lewis Hamilton set his 50th pole position yesterday, relatively comfortably. He starts right at the front to defend his world championship from the best possible position. Jenson Button: "The car felt good, a few areas we still need to improve quite a bit, but generally it’s got a nice feel. A lot better than winter testing. Today will be interesting because racing has been our weakness, last year. Hopefully we can put that right this year… We’ll see how it goes, I really don’t know who we’re racing, no one really knows. We’re slightly surprised to be up by the Force Indias and the Williams, but it’s a nice place to be." The drivers are making their way to the front of the grid for the now-traditional national anthem. Just a few minutes away from the start of the race now, last minute preparations on the grid before it clears of mechanics. One formation lap later and we'll be racing! The top eight are starting on the supersofts that they used in Q2, of course. But further back, we've got the two Force Indias on the soft compound. Also Button, Bottas, Kvyat and two Haas drivers have all opted to begin on the yellow stripes. Tyre blankets cleared, mechanics off the grid, engines fired up. Formation lap is go! Tweet from @ForceIndiaF1: That butterflies in the stomach feeling we last had in Abu Dhabi... is back! Team radio to Esteban Gutiérrez: "Wind is on the low side, across on the main straight, as has been most days but much lower in intensity, so everything looks right." Daniil Kvyat stopped on track after rounding the final corner, unable to make it all the way up to his grid position. Kvyat has climbed out of the car and the marshals are pushing it off track to the side opposite the pit lane. Looks like he's not going to start the race, he returns to the pit lane on foot. The marshals now have pushed the car to the other side of the grid, but are still on track as Hamilton pulls around the final corner once again. Worrying moment, but all good. Kvyat dashes back into the garage awaiting the return of his stricken car. Lewis Hamilton makes a terrible start, swamped by Vettel for the lead and then others as well. Squeezed at the first corner, he drops down to sixth place! Two Ferraris up front followed by Rosberg, Vettel stretching out over a second's lead already. Team radio from Magnussen: "Puncture, puncture." Wehrlein made a sterling start from the rear of the field, he's soared up to 14th place and tucked up behind fellow newbie Jolyon Palmer. Magnussen has dived back into the pit lane for a replacement tyre, that puts him last but he's put on the softs for now. Esteban Gutiérrez reported a problem on the engine of that Haas, he was instructed to push on the straight and he replied "Not working!" Hamilton has closed up to Massa, sweeps around the outside to move up to fifth place. Rosberg is hunting down Kimi Räikkönen now, he has that Ferrari firmly in his sights but has a couple of car lengths to make up yet. There are blue flag complaints already, what with Magnussen's pit stop pushing him down the field. The other Mercedes is also on a charge now, easing up to the rear of Max Verstappen's Toro Rosso. Hamilton is looking for fourth place here. We know Verstappen can be a feisty overtaker, but how are his defending skills? Carlos Sainz comes into the pit lane for his first stop of the day. Ricciardo made a super move on Felipe Massa to push forward into seventh place, that's better news for Red Bull. Team radio from Lewis Hamilton: "I can't get past this guy." That answers the Verstappen defending skills question! Felipe Nasr comes into the pit lane, as the window is now officially open. Massa, Ericsson and Wehrlein all dive into the pit lane. Some super pit stop work going on, considering it's been a while for these guys! Bottas hangs his Williams all the way round the outside of Jolyon Palmer, but when they take the next corner side by side the advantage goes back towards the Renault. This is for 11th place and Bottas waits for the next corner to muscle his way through. Pit stops ahoy, Alonso, Palmer, Haryanto. More importantly Nico Rosberg comes in from third place and he makes a very swift exit that almost takes out his front jackman. Vettel pits from the lead of the race, putting teammate Kimi Räikkönen out in front. Supersofts go on Vettel's car and he rejoins in third place. Vettel rejoins directly in front of Rosberg, who pulls alongside but doesn't quite have the momentum to make a move. The undercut efforts by Mercedes almost worked but not quite... yet. After more complaints from Hamilton on the radio, he'll be pleased to see Verstappen diving into the pit lane. Kimi requests a stop as his front tyres are feeling worn, that would put Hamilton back in the lead as neither have stopped yet. Bottas is really struggling on his tyres and is passed by two cars in one corner. He's down in 11th now. Fastest lap so far for Sebastian Vettel - 1:30.757. Vettel's lap time is four seconds faster than Hamilton, so it's no surprise to see the Ferrari pass the Mercedes as though Lewis is standing still. Hamilton hasn't stopped yet though, of course. Now Rosberg is the driver in Hamilton's mirror, and to be passed by his teammate would not put Lewis in the best mood. At all. Hamilton was having none of letting his teammate past, and he finally pits to leave that battle. Mediums go on that car so he could one stop if he wanted to. Accident between Fernando Alonso and Esteban Gutiérrez. That's a huge crash, there's nothing left of that McLaren. Alonso had to extract himself from a totally mangled chassis, and Esteban was quick to dash over and check he was okay. The Spaniard looked winded but healthy. There's debris all over the track, but we still haven't seen what happened yet. Replays show Alonso was coming up on the back of Gutiérrez, arrived quicker than expected and the car leapt over the rear of the Haas. Barrel rolled through the gravel and dumped into the barrier. The Haas spun round and round and off, but it's the McLaren that is the scary sight. Cars all head back to the pit lane now, strategy is going to be all out the window. Marshals doing their best to clear the track of the debris, brooms out, sweeping away. Huge mess to clear up there. Cars are lined up in the pit lane now, Hamilton has climbed out an wanders off to the garage presumably for a comfort break. The full speed replay is a hundred per cent terrifying. Blink, and the McLaren basically doesn't exist anymore. Tweet from @f1elvis: These are often chaotic times for teams, not everyone will be entirely confident of procedures for restart. Team managers need to be on it. Lots of replays of the incident show the Haas did move over slightly, which surprised Alonso, but it was not in any way malicious - no doubt the stewards are having a good look. Max Verstappen is having a jolly old time, laughing and recapping events with his engineers. Hamilton's front wing got clipped by Rosberg at turn one, and he's been able to have that changed during this period. Free wing change! Session will resume at 16:55. Looks like this stoppage time will not help anyone that was trying to one stop. Hamilton looks like that might have been his plan, so the strategy guys will be scratching their heads. Hamilton returns to the pit lane, and has a good look at the car in front - Ricciardo's Red Bull - before climbing back into his own vehicle. Incident involving Fernando Alonso and Esteban Gutiérrez will be investigated after the race - causing a collision. Magnussen has been pushed forward to the front of the pit lane pack, as cars that have been lapped can go out first to unlap themselves, just like safety car restarts of old. Rio Haryanto has exited his car, the Manor is back in the garage up on jacks - it doesn't look like he's going to rejoin. Yellow flags as the safety car leads the field back out again. It's not all medium compounds up and down the field, Ferrari are on the supersofts up front. Team radio from Hamilton: "How do I turn the alarm off?" "I'm afraid I can't say Lewis." Oof, a bad day gets worse. Tweet from @ManorRacing: Sad to say we've had to retire @RHaryantoracing as his car has a driveline problem. He won't be restarting. Vettel is back on it immediately, setting fastest laps again. Further back, we've got two Brits doing battle with Jenson Button closing to within half a second of Jolyon Palmer. Kimi Räikkönen has come into the pit lane. "Something happened, I broke something." That car is smoking, there's a huge fire in the airbox as the car comes to a halt. Thankfully a man is ready and waiting with an extinguisher. Vettel is wary of being on the wrong tyre now, he's trying to stretch out a lead before having to come back into the pits again. Incident involving Marcus Ericsson under investigation - working on the car at the 15 second signal. Drive through penalty for the Sauber driver. The Hülkenberg/Bottas battle have closed up to the Haas of Romain Grosjean, to make it a three-way fight. Lewis Hamilton is tucked up behind another Toro Rosso, but this time it's Carlos Sainz who is facing the defending champion's wrath. Half a second between the pair at the moment. Ericsson crawls through the pit lane to take his drive through penalty, that drops him down to last place. We're keeping a beady eye on Grosjean, who is running strongly in eighth place for Haas - could the new team get points on their debut? Hamilton is still struggling to get past the Toro Rosso of Carlos Sainz, but it can only be a matter of moments. Button comes into the pit lane to change to the medium compounds. Carlos Sainz also pits which gives Hamilton the position without a fight. Verstappen is next on Lewis' agenda. Verstappen follows his teammate into the pit lane. It's like the parting of the seas here. Despite Vettel's best efforts, he's not able to pull out a gap on those behind him. Rosberg is just about 1.5 seconds behind, so when Ferrari call their driver in for a change of tyre, it could hand the victory back to Mercedes. No one was ready for Verstappen's pit stop meaning it was crazy slow and puts him back down in 12th place, behind his teammate. Terrible delay! Sainz makes a dive to the inside of Sergio Pérez, they are inches away from contact but the Toro Rosso makes it stick. Team radio from Max Verstappen: "How many times have I said I have problems with the tyres? I wanted to pit first!" Proper little sulk from Maxy. Vettel pits from the lead, which puts Nico Rosberg in P1. It's the softs that go onto the Ferrari, which is running the risk they'll go off the cliff before the end of the race, but will be faster than the mediums. It was a five second stop, so not the fastest, but he's out in fourth place. The top three as it stands is Rosberg, Ricciardo and Hamilton. Vettel is in fourth, but he's got nine seconds to make up before facing the task of overtaking a Mercedes. After such a great start, Wehrlein is now at the rear of the field, Ericsson just ahead. Jenson Button also struggling down in 15th. Jolyon Palmer currently sitting in ninth place, another that could potentially pick up some points on his debut. Verstappen asks if he's allowed to make a move past his teammate and is given the go ahead. It sounds as though Max wants team orders but the pit wall sound more as though they want it done organically. It's four tenths between the two Toro Rossos here, and they are squabbling for the right to make a move on Palmer in the Renault. Sainz is told he has to push or they're going to swap the cars next lap. Meanwhile there's a sick sounding Sauber heading to the pit lane. Marcus Ericsson looks about to retire. Verstappen has a go on his teammate as Sainz locks up, tyre smoke pouring from those mediums. No change of position yet though. Hamilton closes to within DRS range of Lewis Hamilton, and it's the work of but a moment for the Mercedes to sweep past the Australian. Second place for Lewis. Ericsson's Sauber is up on jacks in the garage, but he's still in the car - could he be coming back out? Sainz finally makes a dive past Palmer and easily dispatches the Renault. Verstappen has to muscle round the outside of the yellow car, but he also makes it past. Palmer's dropped down to 11th, so no points at this stage. And the Toro Rosso team battle is still on. Ricciardo pits for a set of super soft tyres. Ericsson has not returned to the field, a retirement for Sauber in Australia. Almost everyone still running is on the medium tyre now. Only Sebastian Vettel (softs) in third and Daniel Ricciardo (supersofts) in fifth have opted for a different set. Romain Grosjean still running in sixth place, but Hülkenberg is gradually closing the gap to within DRS range. Ricciardo's fresh set of supersoft tyres make easy work of Felipe Massa, the crowds cheer as sparks fly from the Red Bull. Fourth place for the Australian. Team radio from Max Verstappen: "All these other cars are pulling away, and now you don't let me past, it's a ******* joke, really." I'm really enjoying the boooops here. Fastest lap for Daniel Ricciardo - 1:29.466. Angry little Verstappen has a big wobble after running wide, but he's soon back on the tail of his teammate again. Ricciardo is improving on his own fastest lap, he's down to 1:28.997. That supersoft tyre is super-quick! Team radio to Sergio Pérez: "Your front brake wear is critical. We will not make it to the end like this." Hamilton locks up, his tyres look like they're getting old now. Vettel has closed up to within six tenths of the Mercedes. Hamilton is about ten seconds away from race leader Nico Rosberg, but he's having to turn his mind to defence now. Brief yellow flags as Max Verstappen spins on track. Replays show Sainz locking up and Verstappen going into the back of him. Front wing damage and a spin for Verstappen. Vettel's within half a second of Hamilton, but does he have the pace with just three laps to go? It doesn't look like the Ferrari is going to be able to take the place, unless Hamilton makes an unusual mistake. Meanwhile, Rosberg has got a comfortable lead and is heading for the first win of the season. That's not going to help - Vettel spins and runs wide on the grass. Two laps to go. Verstappen is fighting every inch of that Toro Rosso to try and hassle his teammate right to the chequered flag. You can see the rage radiating through the helmet. Nico Rosberg wins the Australian Grand Prix! Hamilton and Vettel will join Rosberg on the podium, finishing in that order. Grosjean does manage to finish in sixth place to pick up a fantastic points haul for Haas. Tweet from @SauberF1Team: Congrats @MercedesAMGF1 for the win and @HaasF1Team for points in your first ever #F1 race! Eight brilliant points for Haas. Meanwhile, McLaren sadly have another pointless start to the season. 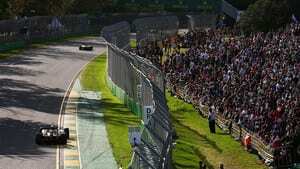 "Chequered flag, Romain, chequered flag. Absolutely amazing, dude." "Guys, listen to me. This is a win for us, this is a win. Unbelievable from everyone. I don't even know where we finished. Unbelievable." "Amazing dude, you finished P6. Thanks for an amazing debut for Haas F1 team." "Oh my goodness, welcome to Formula One, Gene. This is the day, this is history, guys." Tweet from @F1Racing_mag: Tyre strategies will start to converge, of course, but the pace of @ScuderiaFerrari promises some interesting battles as the year goes on. Trophies and champagne on the podium. It's fair to say that Hamilton is relatively happy with that one, he even sprays champagne directly at his teammate (in a nice way). Podium interviews - Nico Rosberg: "It’s been a great weekend, thank you to the team, they’ve done an unbelievable job giving us a great car. Beating the Ferraris was great. We loved it and I’m super excited… Early days but of course a perfect start. We’ve got to keep an eye on the red guys. We need to give it everything to stay ahead for sure." Podium interviews - Lewis Hamilton: "Honestly it was a great race. I loved the fact we had to come from far behind. It was very tricky out there, glad that no one was injured in the shunt. Afterwards it was just trying to get through the traffic, it’s impossible to follow round here. I’m really happy to get the result, it’s a great result for the team. I’ve had much worse in a first race, I take this as a real bonus. Long, long way to go, bag the points today." Podium interviews - Sebastian Vettel: "I went for it, obviously the start was mega, I was very happy. It reminded me of Hungary last year. Then I think we settled into a rhythm, it’s much better when you’re in the front. The red flag you can argue didn’t help us… we didn’t expect what both of them did, going on the hardest compound until the end. We tried to go more aggressive, maybe it didn’t work, but ultimately very happy with third. Hopefully it will work next time I’m here." Mark Webber was up on the podium asking the questions there, and whilst Hamilton was keen on dousing Rosberg in more champagne during the interview, Vettel focused his bottle on his old teammate. Poor Webbo! Great job by Felipe Masa to finish fifth in what appeared to be a relatively quiet race for the Williams driver. Teammate Bottas finished eighth for a nice double points finish. Daniel Ricciardo: "I’m really happy. Towards the end we were sitting in the top three, I had the fairy tale in my mind of being on the podium here. Fourth is great, but I’m more happy with the pace we had. Not that far off Mercedes and Ferrari’s pace. To come out here in the first race, I think we’ve exceeded expectations and I’m happy with that. "I think tyre management was good, we seem to be pretty kind on tyres, that’s the first box you want to tick. We passed cars today, so we’ve definitely found a bit from the power unit. I think there’s more to come in the next few races. I think we can definitely aim for more top fives once we get this update. From that point, I want to spray some more champagne." Jolyon Palmer: "Bit frustrating to be 11th, but I’m happy with the race. A good start, for me no major incident. But yea, a bit frustrating. One more place would have been great. We didn’t have any more pace in the car, the Toro Rossos were trying to pass me at every corner, I couldn’t have held them off any longer. We need to have this as a building block and move forward." A brilliant race after a disappointing qualifying. So many unanswered questions going into the season have already answered, but we've got a whole host of new ones! Haas didn't do so well in qualifying but they more than made up for it in the race. It would have been interesting to see what Gutiérrez could have achieved but for the crash with Alonso, although it was that very same crash that allowed Grosjean to one stop his way to success. Red Bull had more pace than we might have expected and Ricciardo seems confident there's more to come. Again, it's disappointing that they only had one car get to the finish, Kvyat must be quietly fuming somewhere. Talking of fuming, who wants to be a fly on the wall at the Toro Rosso debrief today? Verstappen appeared very riled and expecting team orders where they weren't really necessary. We didn't hear much from Sainz but the two colliding together will not go down well with the team bosses. Fantastic demonstration of how safe the cars are these days with Alonso's lucky escape from the car. The Spaniard says he doesn't place any blame for the crash and is just grateful it's all worked out okay. We've got two weeks now until Bahrain, so plenty of time to analyse, question and comment on what happened, and of course predict what's going to happen next. We know that qualifying will be back to normal in the desert, but what happens after that, who knows?